Neill Blomkamp burst onto the movie scene with his science fiction classic District 9. The 2009 movie was exhilarating (Silenced a sold out Miami theater for two hours) and a bona fide box office hit ($210 worldwide on a $30 million budget). With his first film Blomkamp become a fresh presence on the burgeoning science fiction scene spearheaded by Duncan Jones, Rian Johnson, Gareth Edwards and Shane Caruth. District 9 was a breath of fresh air that didn’t pander to the lowest common denominator. Elysium is a different story. It hits you over the head with its interstellar country clubs, lack of universal healthcare and never-ending desolation that looks like Rio’s slums ad nauseam. Blomkamp’s budget has grown but the subtlety has shrunk. The suspense, originality and clear voice are muddled with the corporate budget and nods to the mainstream. Everything is bigger including the action involving Sharlto Copley’s wonderfully murderous agent who blows people up spectacularly. It all resorts to beautiful action pieces that look like every other set piece in Wolverine, Star Trek and World War Z. The biggest difference is that dude’s get blown up REAL good in Elysium (Think flare gun death scene in The Last Stand but much more practical and visceral). Elysium tells the story of a diseased and dirty 2154 earth that is loaded with tattoos, graffiti and Matt Damon. Damon is an ex-con who is trying to become an upstanding citizen. He works at a factory, is respected in the neighborhood and finally reconnects with his childhood friend/crush. However, one fateful day he is blasted with radiation and given five days to live. Thus, he gets a badass robot suit medically attached to him and decides to take Elysium by force. thwarting him is the steely Jodie Foster who is all calves and dueling accents. 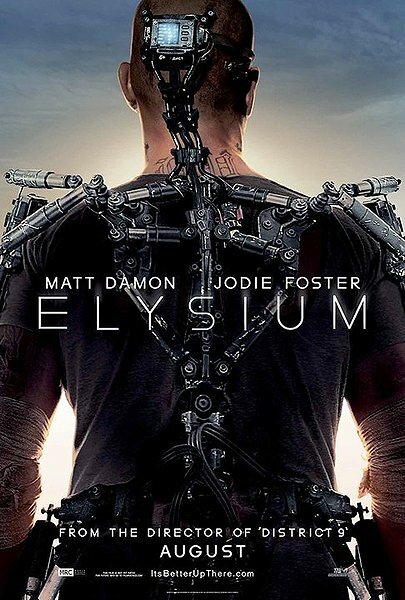 Elysium is a jack of all trades but master of nothing. It doesn’t have the laser pointed low budget focus of District 9 and waters down it’s message for the mainstream. I feel like District 9 was the hit foreign film and Elysium is the American remake. “Jodie Foster who is all calves” ahaha so true!